As science is more and more subject to grave misuse as well as to use for human benefit it has also become the scientist's responsibility to become aware of the social relations and applications of his subject, and to exert his influence in such a direction as will result in the best applications of the findings in his own and related fields. Thus he must help in educating the public, in the broad sense, and this means first educating himself, not only in science but in regard to the great issues confronting mankind today. Message to University Students Studying Science', Kagaku Asahi 11, no. 6 (1951), 28-29. Quoted in Elof Axel Carlson, Genes, Radiation, and Society: The Life and Work of H. J. Muller (1981), 371. It is astonishing how much the word infinitely is misused: everything is infinitely more beautiful, infinitely better, etc. The concept must have something pleasing about it, or its misuse could not have become so general. Aphorism 133 in Notebook J (1789-1793), as translated by R. J. Hollingdale in Aphorisms (1990). Reprinted as The Waste Books (2000), 155. Misuse of reason might yet return the world to pre-technological night; plenty of religious zealots hunger for just such a result, and are happy to use the latest technology to effect it. The Heart of Things: Applying Philosophy to the 21st Century (2006). The dropping of the Atomic Bomb is a very deep problem... Instead of commemorating Hiroshima we should celebrate... man's triumph over the problem [of transmutation], and not its first misuse by politicians and military authorities. Address to New Europe Group meeting on the third anniversary of the Hiroshima bomb. Quoted in New Europe Group, In Commemoration of Professor Frederick Soddy (1956), 6-7. [Science] is not perfect. It can be misused. It is only a tool. 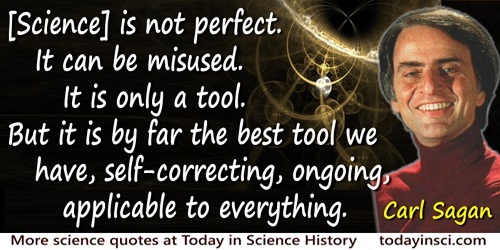 But it is by far the best tool we have, self-correcting, ongoing, applicable to everything. It has two rules. First: there are no sacred truths; all assumptions must be critically examined; arguments from authority are worthless. Second: whatever is inconsistent with the facts must be discarded or revised. ... The obvious is sometimes false; the unexpected is sometimes true.